Keep life organized with this wooden magnetic perpetual calendar. Open the fabric hinged boards to reveal a calendar grid on one board, while the other board keeps all the magnets close at hand. A sturdy cord is attached for hanging. 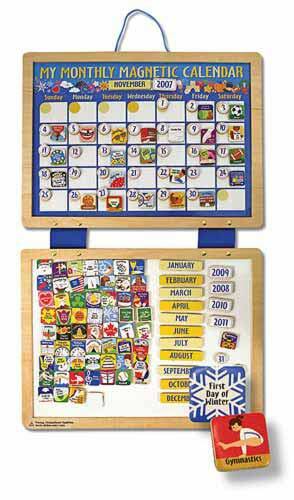 These dry-erase boards include 134 magnets including years, months, days and most holidays and childhood activities.